The updated coalition agreement must obligatorily include a provision on the adoption by the parliament of the law on lustration, which was finalized together with the Venice Commission, MP from the People's Front faction Leonid Yemets has said. "The issue of finalizing the law on lustration jointly with the Venice Commission should be listed in the coalition agreement and voted in the parliament with a very clear term of fulfillment," Yemets said on the sidelines of the parliament. He confirmed the People's Front had prepared its part of additions and changes to the coalition agreement. 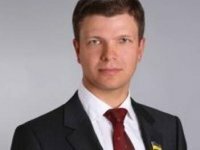 The MP noted that the Venice Commission along with the people's deputies of Ukraine finalized the law on lustration, which is now being considered by the Constitutional Court of Ukraine. "We recorded the conditions for the adoption of the law on lustration in the coalition agreement," he said.